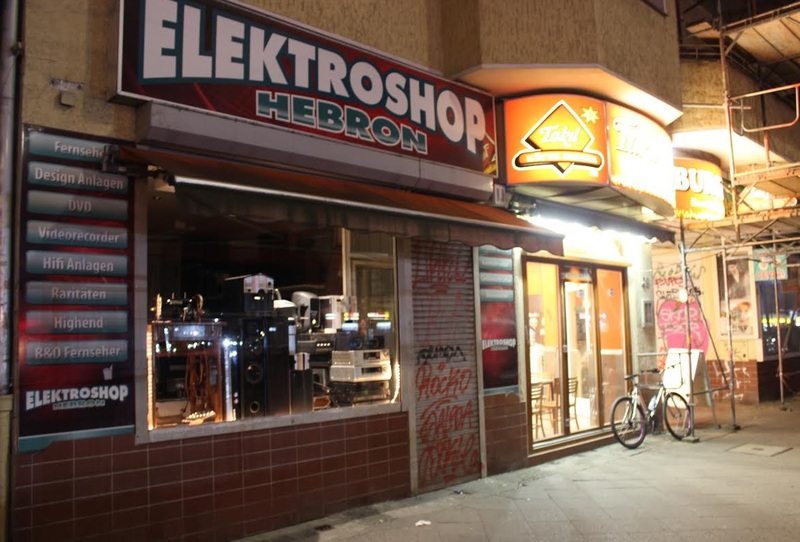 Neukölln, Berlin’s hipster district, is the gritty face of the city’s burgeoning gentrification process. 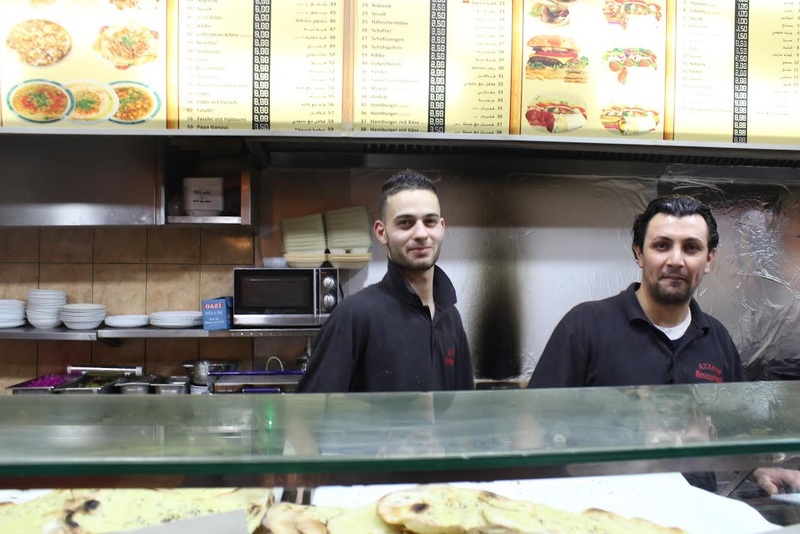 Here, shisha cafes and falafel shops satiate Middle Easterners and Westerners alike, the stark divide between the ones we define as immigrants and those we call expats clear. The latter came for the low rents, multicultural mood and cheap falafel. They stayed for the cozy bars, candlelit restaurants and new night-life spots which are popping up all the time. Although best known as ‘Little Istanbul’ for its 36,000-strong Turkish population, nearly 17,000 of Berlin’s 83,000 Arabs reside in Neukölln. Of these 83,000 an estimated 35,000 of these are of Palestinian origin and over 25,500 are Lebanese, either by birth or family history. 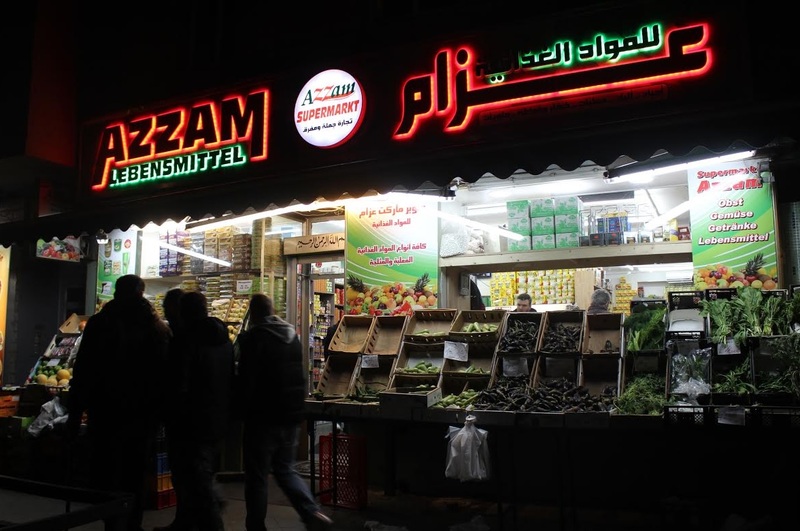 Azzam Supermarkt sits on a section of Neukölln thoroughfare Sonnenallee I’ve come to know as ‘Little Palestine’, owing to the amount of Palestinians I’ve met there. I go to this little shop to buy dates, warak dawali (grape leaves filled with rice) and even hummus in a can. It’s not the same as delicious fresh hummus, but it’s cheap and if you add a little water, the texture is just right. I speak to the owner, a middle-aged man born in Lebanon to Palestinian refugee parents. I ask him if he would like to go to his parents’ homeland one day. Next door, Azzam Restaurant sells falafel sandwiches and other Middle Eastern snacks and is best known for its flavorful hummus, some of the best in Berlin. As I take photos of the supermarket’s shop front, a young man, who I soon came to know as 21-year-old Muhammad, stuck his head out of the restaurant’s sliding window. I oblige and Muhammad, whose parents come from Jaffa, hands me a piece of falafel as I walk in. I snap a few photos and stay for a chat about food, ‘Falastin’ and flags. “There are a lot of Palestinian flags around here,” I observe. Ali, the owner of Infiniti shisha cafe, also on Sonnenallee, is one of these proud Palestinians. 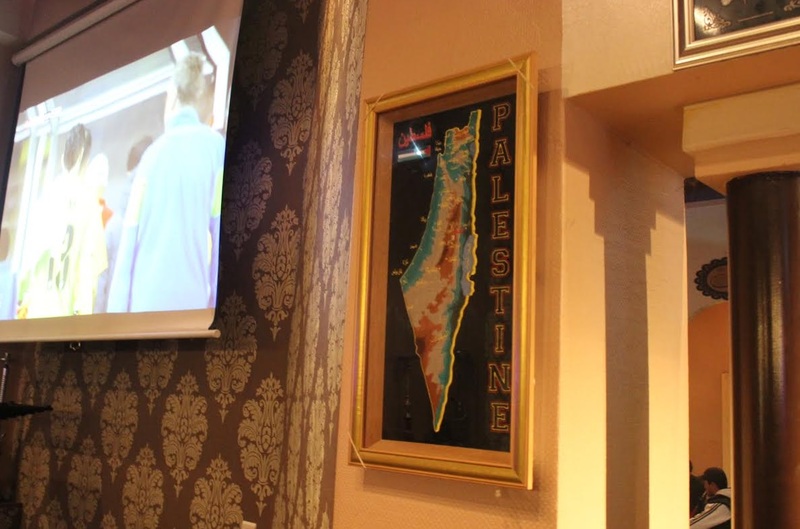 A flag hangs above his bar and a map designating all of the land from the Jordan River to the Mediterranean sea as Palestinian adorns the wall. “I’m Palestinian,” he tells me. “I mean, I’m German now, but my heart is in Palestine. Nearby, there’s an electronics shop named after the divided West Bank city of Hebron and further down still is Konditorei Al-Jazeera, a Middle Eastern cake shop. It’s an understated, blink and you’ll miss it kind of place, but it’s very popular for its Middle Eastern sweet treats. Once again, the Palestinian flag greets visitors on entry, the interior décor closely resembling the unassuming bakeries I visited in Arab towns in Israel. On my first time there, I meet a 19-year-old Berlin-born Palestinian woman whose parents were born in a refugee camp in Tripoli, Lebanon. I ask her if they have knafeh. Knafeh, the Levantine sweet cheese pastry, is simultaneously sugary, savoury, soft and crunchy and best served warm. I tried it for the first time in Nazareth at well-known traditional bakery El Muchtar. There’s no knafeh on this occasion, but they offer to make a fresh batch for half an hour’s time. Feeling hungry, I go for the baklava instead. She later tells me she likes life in Berlin. It’s free and open compared to the Lebanon she came to know on her brief holidays there. She appreciates the lack of volatility here. While she would like to visit the West Bank one day, Berlin will always be home. The owner, Raouf, asks where I’m from. For a split second, I pause. Somewhat naively, I was taken by surprise by his assignment of Akko (I knew it by its Hebrew name) to Palestine. It’s in the north of what I know to be the state of Israel, the large Arab community of 1948 Palestinians are now Israeli citizens, but this reality is of course something that many Palestinians don’t accept. Thinking it best not to start a geopolitical discussion while surrounded by pastries, I just nod and smile. After all, conversation about the conflict has a way of turning otherwise composed, rational people into the embodiment of rage. I had no intention of getting into such a debate while eating cake. In his reality, Akka is Palestine. I had no reason or desire to try to convince him otherwise. I tell him instead how I recently visited the town and show him the photos on my phone of the souk, old market square, narrow winding streets, stone archways and mosques. There are, naturally, Arabs in Berlin who view Jews in a hostile manner. To deny this would be an omission of facts. In response, Israelis I know have revealed they often tell Arabs (and others) they’re from Spain to avoid fights, criticism or simply unwelcome dialogue about the conflict. I add that I hope there will be a positive conclusion for Palestinians. “One day, all Palestinians will return to live in Palestine,” Raouf adds. Judging by the current situation, anyone would be forgiven for questioning this, for losing hope in the Palestinian cause, most of all the Palestinians themselves. The lives they’ve made for themselves in Berlin and elsewhere are testament to their stateless status in the Promised Land. But, in fact, no one’s more optimistic than them. The Qur’an tells them they will be liberated one day, and that’s that. Conceding defeat would be to go against God’s word. For such a thing to happen, of course, either the Palestinian side would need to take land by force, or Israel’s foreign policy would need to take a 180-degree turn, trading in Jewish nationalism for sympathy towards Palestinians. That’s not likely. With each settlement expansion, Gaza war, failed round of peace talks, terrorist attack, death or arrest, anything other than the continuation of the status quo seems impossible. The right of return has been rendered by Israeli governments as a non-starter time and time again. Ask a Palestinian where their sense of optimism comes from and they will likely answer, “It is God’s will.” In an otherwise hopeless situation, their religion is a useful source of strength. There are varying levels of Palestinian support for a two-state solution, depending on the survey you read or the people you speak to. This backing is only likely to dwindle as more time passes and an agreement drifts further out of reach. Certainly the people I’ve spoken to in Berlin seem fixated on a one-state solution. No matter how awful things get back home, they fight for the ‘free Palestine’ movement through prayer, demonstrations, flag-flying and graffiti on the city’s walls. Whether we will someday see the creation of a Palestinian state adjacent to Israel or a joint Israeli-Palestinian state of all its people, the truth in the eyes of many Palestinians is undeniable: their dream of freedom will come true one day.